Any good outdoorsman knows how to make a fire in the rain. Once you’ve mastered the skill of building fires when the weather is dry you’ll want to hone your skills for starting a fire when the weather goes bad. 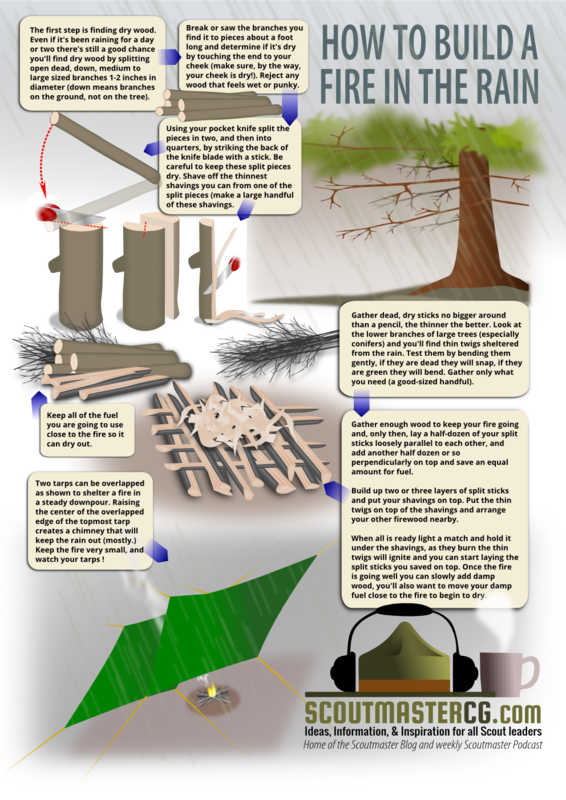 The infographic explains a few strategies for getting a fire going when you have nothing but a match and no fire starters. I always carry fire starters but I won’t use them unless it’s absolutely necessary, I’ll save them for an emergency or when it’s otherwise impossible to light a fire without them. The first step is finding dry wood. Even if it’s been raining for a day or two there’s still a good chance you’ll find dry wood by splitting open dead, down, medium to large-sized branches (down means branches on the ground, not on the tree). Break or saw the branches you find it to pieces about a foot long and determine if it’s dry by touching the end to your cheek (make sure, by the way, your cheek is dry!). Reject any wood that feels wet or punky. Using your pocket knife split the pieces in two, and then into quarters, by striking the back of the knife blade with a stick. Be careful to keep these split pieces dry. Shave off the thinnest shavings you can from one of the split pieces (make a large handful of these shavings. Gather dead, dry sticks no bigger around than a pencil, the thinner the better. Look at the lower branches of large trees (especially conifers) and you’ll find thin twigs sheltered from the rain. Test them by bending them gently, if they are dead they will snap, if they are green they will bend. Gather only what you need (a good-sized handful). Gather enough wood to keep your fire going and, only then, lay a half-dozen of your split sticks loosely parallel to each other, and add another half-dozen or so perpendicularly on top and save an equal amount for fuel. Build up two or three layers of split sticks and put your shavings on top. Put the thin twigs on top of the shavings and arrange your other firewood nearby. When all is ready light a match and hold it under the shavings, as they burn the thin twigs will ignite and you can start laying the split sticks you saved on top. Once the fire is going well you can slowly add damp wood, you’ll also want to move your damp fuel close to the fire to begin to dry. Two tarps can be overlapped as shown to shelter a fire in a steady downpour. Raising the center of the overlapped edge of the topmost tarp creates a chimney that will keep the rain out (mostly.) Keep the fire very small, and watch your tarps! Consider joining all the other great folks who have become Backers! It takes at least twice as much tender as normal to start a fire in the liquid sunshine that many of us experience. You are not only applying heat to the wood to make it burn, but evaporating the water, too, which keeps the heat down. And, it does need to be protected from the heavy rain in some manner. I haven’t seen the overlapped tarp method. * It can’t rain like this all day can it? Nice article! Might I suggest that using a “pocket knife” to split wood by striking the back of the blade with a stick (AKA “batonning”) is very likely to result in damage to the knife? Instead, and consistent with B.S.A.”s July, 2008 advice that a short fixed-blade knife is ideal for camping, a fixed-blade knife should probably be used for that task. Teaching safe batonning technique will also usually be consistent with our obligation (recognized in G2SS as of 2011) to teach the proper use of all “legally-owned” knives.